It can be hard at this time of year for our littled feathered friends to get a drink or a quick bath due to frozen conditions. But you can get this really cool heated bird bath that works on your deck railing. It attaches to the railing easily and is also hinged so that you can dump any stagnent water out and refill with fresh. It is plastic construction that can take the cold and there is a built in thermostat under the surface to stop the water from freezing. This is a great accessory to have for your homemade bird food and feeders. You will attract lots of birds when they have access to ice free clean water. The little built in heater operates at 150Watts. It only comes on when needed and since this can be used all year round you can store the plug underneath for safe keeping until next winter. 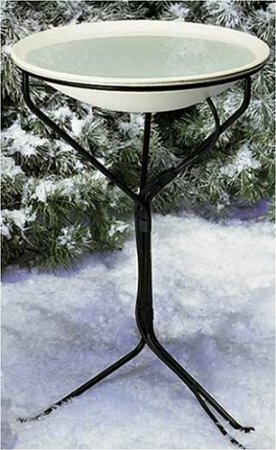 This heated bird bath comes with a stand so that you can put this out in your yard if you prefer. 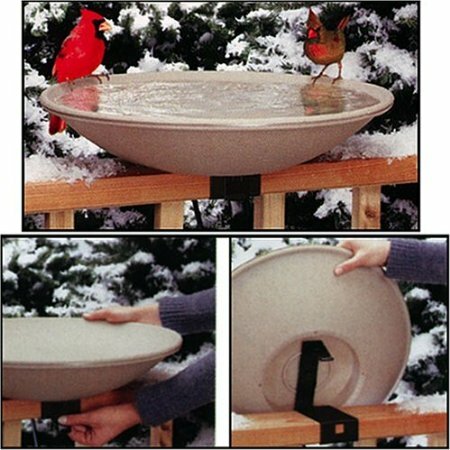 Made in the USA out of tough materials, the 20 inch diameter bowl has a slightly rough edge so that birds feet can land and get a drink. It is thermostatically controlled with 150Watt heater and only comes on when needed. Once the warmer weather arrives you can simply tuck the plug back up underneath for storage where it will be protected until next cold season. This and your homemade birdfood are an awesome way to attract birds as it can be hard for them to get a drink in the frigid weather. Just click the link if you would like to find out more about these great year round bird baths. 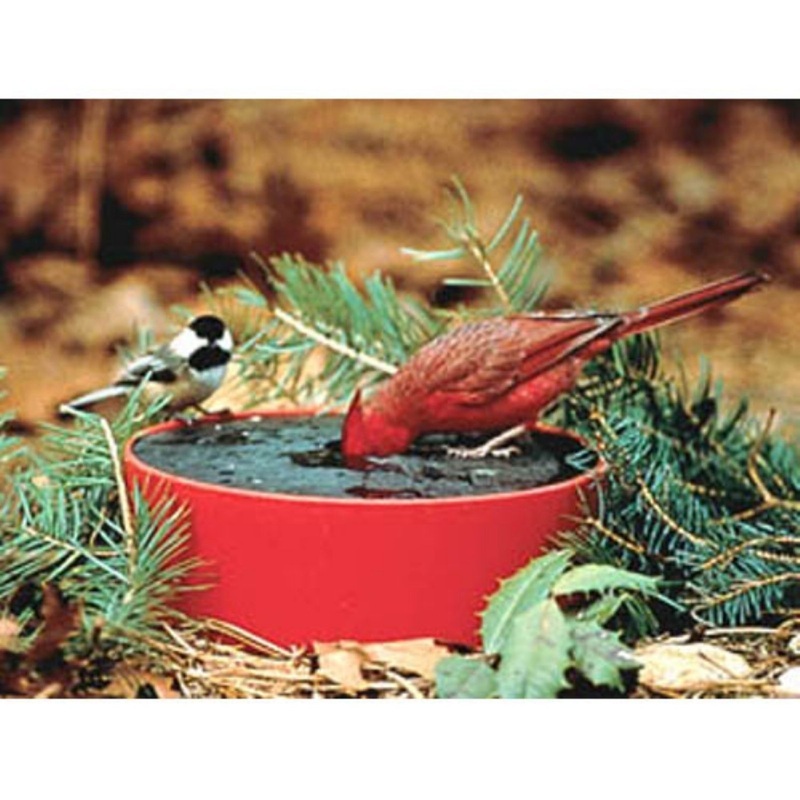 This is another great option for making sure your backyard birds find some fresh water. This works well in the summer too as it will keep dirt and debris out of the water. You simply fill this bowl and place the solar collector lid on top. There is a 1.5 inch hole in the lid where birds can get a fresh drink. Even in the winter the solar lid will collect heat and keep the water from freezing. This is for drinking water only, but works well if you don't have access to electrical outlets. You simply place this bowl somewhere secure such as your deck or simply on the ground in an area that get plenty of winter sun or daylight and it will stop the water from freezing. As you can see by the picture the birds seem to find it. So this would also make a great addition to your backyard bird feeders, as you can place it anywhere with not cord restrictions. In the summer you could simply place it in the shade so that the water does not heat but is protected from dirt and debris. Just click the picture or the link to find out more.